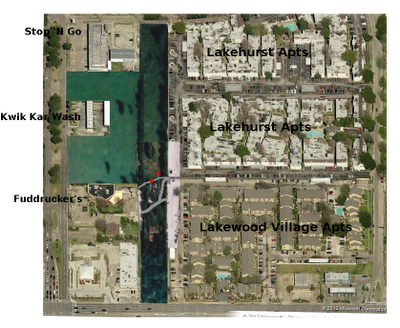 In Act I, we learned that the Hartley's walked from Victor's Lakewood Village apartment north through the wooded and weedy area that runs alongside both Lakewood Village and Lakehurst apartment complexes. At some point, Barbara became concerned they were being stalked, and she ran to the Stop N Go. Drew came running after. The employees called the police. In Act II, we learned that Barbara left the Stop N Go sometime after Drew did, and did so without Drew being aware of (or even expecting) it. Barbara secured a ride back to Victor's apartment, probably with Victor and friends. 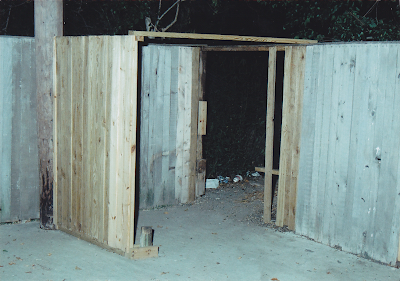 When Drew returned and could not find Barbara, he hunted for her, eventually became concerned she had been abducted, contacted the police, ran across Barbara and friends at the car wash, and reported to the police that Barbara had been found. By that time, the police had already discovered Shandra and Marcell while searching for Barbara. In this Act III, we learn of Drew's search for his wife, and the significance of that search. It seems as if Drew did not completely buy into Barbara's claim that they were being stalked through the field. Drew: While I was walking through the woods, we heard movement in the brush. We didnt [sic] see anybody at that point, but think that we were being chased. We ran to a nearby Stop-N-Go where my wife told the employees what had happened. The employees called the police. Barbara: I thought that there was someone on the path and I asked Drew if there was someone behind us and he told me that I was hearing things. And we walked a little further and he looked back and he said that there was somebody there. ... I began to speed up and then the footsteps began to get faster behind us. I then began to run and Drew didn't run right away but then he began to run behind me. Even after Drew returned to the Stop N Go and found Barbara gone, he showed no reluctance about walking alone through the area where Barbara had claimed to see threatening figures. Drew walked from the Stop N Go, south along (or within) the wooded, weedy strip of land, cut through either the small, northern trail (Shandra's Trail) or (more likely) the larger southern trail, and entered the Lakehurst Apartment complex through the now infamous hole in the fence. Drew: I went on through the fence opening going into Gino's apartment complex. I don't know about you, but wouldn't walk alone through there at night, particularly if I believed I had just been chased from that field by shadowy, threatening figures who soon thereafter abducted my wife. It seems pretty clear to me that Drew was not particularly concerned about his wife at that point, or about menacing figures in the brush. He was simply trying to locate Barbara because she left the Stop N Go unexpectedly. As Drew approached the hole in the fence, however, all hell broke loose. He heard a woman scream. I assume he turned and pointed his flashlight in the direction of the scream. I suggest further that it was then he saw two men dragging a woman into the field. Drew presumed the woman was his wife, and only at that point did he become frantic. Drew: As I did so, I heard a yell. I thought that it was my wife. I went to Gino's and was frantic. I told Gino, Oscar and Teal somebody took my wife off and she disappeared. I recognize that the scenario I have just portrayed does not completely accord with the entirety of Drew's report. I suggest no logical story can completely accord with Drew's statement. Drew: I went back to the Stop-N-Go to get Barbara. Barbara wouldnt [sic] go past the Stop-N-Go unless she knew that Gino or somebody was home. Anyway, Barbara and I started to walk through the car wash. While walking along, we were walking and she walked on one side of a wall and I walked on the other side. When I got to the end of the car wash, Barbara was gone. I went on through the fence opening going into Gino's apartment complex. As I did so, I heard a yell. I thought that it was my wife. I went to Gino's and was frantic. This explanation makes no sense whatsoever. 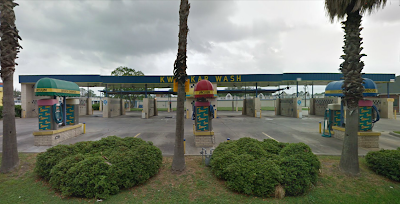 Consider first an image of the car wash, from my early post Geography. How could Barbara have been abducted from the car wash if Barbara was not in fact abducted? If Drew thought she had been abducted there, why did he immediately walk casually through the field as if nothing significant had happened? 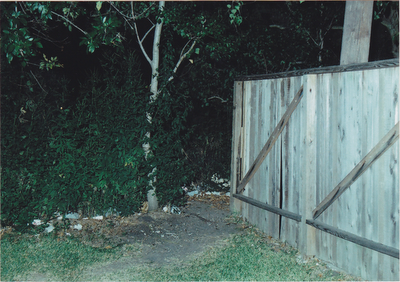 Why did he not become frantic until he heard a woman scream as he neared the opening in the fence? And since Barbara never was abducted, who did Drew see being dragged into the woods? Cook and Becker: Officers riding Unit 20G40 were flagged down by a person known as Drew Curtis Hartley regarding his wife missing. The time was approx 2330 hrs and the location was the Stop N Go parking lot at 2303 S. Kirkwood. Hartley stated his wife had been walking in a car wash bay located east of the Stop N Go. He stated possibly two black had [sic] abducted her and drug [sic] her into the field located south of the Stop N Go: Hartley had a flashlight in his hand and stated he had been looking for his wife for a while. I suspect Drew frantically told Cook and Becker a less-than-perfectly-clear story of all that had happened that night. I suspect he told them about Barbara being initially scared earlier as she walked near the car wash, and I suspect he told them about seeing two black males dragging his wife into the field south of the car wash. I think that Cook and Becker's mention of these two events in consecutive sentences does not mean that Drew claimed he witnessed the abduction when he was at the car wash. It certainly doesn't mean that Barbara was abducted from the car wash, since Barbara was not abducted. Note also that Drew's claim of witnessing an abduction by two black males did not make it into his report. If it had, his eyewitness evidence would have contradicted the official HPD story that Shandra and Marcell were killed by one black male, specifically Preston Hughes III. It's just as likely that Drew refused to sign the statement because it wasn't accurate in critical detail. Perhaps the disconnect between what he actually told them and what they wanted him to sign triggered or supplemented his concern about being set up for the crime. Interestingly, it wasn't simply Drew who didn't sign his statement. Sgt. P.C. Motard didn't sign the statement either, even though there was a signature block for him as the typist, even though Sgt. C.R. Williams signed Barbara's statement as her typist. So we don't have anyone willing to affirm that the words typed on Drew's statement were the ones Drew spoke or even the ones P.C. Motard typed. We just have words on a paper, allegedly being an accurate representation of Drew's interview. Those words somehow leave out the astonishingly significant detail of Drew seeing two men drag a woman into the brush near the point where Shandra and Marcell were found, near the time they were killed. You won't find Drew's unsigned report in the compilation of police reports provided by the HPD. Instead, you'll find a summary of Drew's unsigned report written by Sgt. Gafford. Not only does Sgt. Gafford exclude Drew's claim about witnessing an abduction, Gafford even excludes Drew's claim he heard a woman scream from the very field where Shandra Charles was murdered. Gafford: Drew lost track of his wife at one point near the car wash a short time later, and he began searching for her, enlisting the aid of a civilian and also the officers who were responding to the call, they were able to learn that she had caught a ride with some males in a truck to their friends [sic] apt at the Lakewood project, and it was during this time that the officers were flagged down at the Fuddruckers. Sgt. P.C. Motard obtained a written statement from Drew however he [Drew] would not sign this statement because he thought he was being handled as a suspect in the deaths of the compls. After conveniently excluding Drew's claims of hearing a woman scream and witnessing an abduction, Sgt. Gafford had the temerity to claim that Drew had nothing to offer. Gafford: The information provided by these witnesses does not appear relevant to this case, with the most important exception being their call was the one which police police in the area at the time of the discovery of the compls in this case. Instead of ignoring Drew's claims of hearing a scream and witnessing an abduction, I accept them as probably real. Drew did, after all, have the Stop N Go employees call the police and report that his wife had been abducted. When the police arrived, Drew did tell them that he had observed two blacks dragging a woman into the brush. He initially thought that woman was his wife. He later confirmed it was not. It leaves open the question of who Drew saw being dragged into the field. I suggest it was Shandra. I will therefore use Drew's claim to approximate the time of Shandra's abduction. I will estimate the elapsed time for each event Drew claimed between the scream and the time he met the police. I will total the elapsed times and subtract the total from 11:30 PM, the time when Drew met the responding officers in the parking lot of the Stop N Go. To estimate the elapsed times, I will rely on my Frankenmap, which I proudly present once again below. According to Goggle, that map is 5.5 minutes tall and 4.5 minutes wide, assuming you are walking. I'll assume Drew moved at a pace that made the map 4 minutes tall and 3 minutes wide. That's enough to get me started. Hang on. Here we go. Plain text is from Drew's report. Italic text is my comment. Bold text is my elapsed time estimate. I get a grand total of 108 minutes. If that estimate is correct and if Drew did indeed meet the police at 11:30 PM, then Drew heard the scream at 9:42 PM. That time is interesting. Evelyn Brown claims to have last seen Shandra alive and well in a Lakewood Village apartment at 9:30 PM. (See Shandra's Final Day.) The police, however, never attempted to question (or even identify) the friends Shandra and Evelyn had been visiting in Lakewood Village that night. I find it astonishing that the police would not want to speak to the last people to see Shandra alive and safe. They didn't, however, and we have nothing to challenge Evelyn's time estimate. If Evelyn is correct in her estimate, Shandra left her friends' apartment soon after Evelyn left, to run whatever errand she was going to run. I still suspect that the errand had to do with drugs, even more so now that I see the autopsy report described multiple needle marks in the bends of each arm. Based on my interpretation of Drew Hartley's statements, I believe Shandra was soon thereafter pulled into the weeds by two black males. At least one of them had an Afro. At least one of them had a knife with a double-edge blade approximately 5/8" wide and over 4" long. At least one of them knew how to use the knife to put a quick end to life of another human. Great and interesting breakdown! Was there a toxicology report included with the autopsy? Were any legal or illegal substances detected in Shandra's system? If this timeline is correct, Shandra could have placed an order at Fuddruckers just before they closed. I don't understand why someone has to stand in a dark overgrown field to purchase a small quantity of drugs, be it marijuana, heroin or anything in between. Is this a place where regular drug transactions occured? Was there any type of profile done on Shandra to determine what type of person she was, ie. recreational drug users or dealer, poor student/average/honor student, irresponsible and reckless, etc. etc? Do you believe Drew saw Shandra being dragged into the woods from the opening near Fuddruckers? You put the death of Shandra around 9:30, so do both victims survive the two plus hours with those wounds? It's a week case and I see why the cops dismissed it especially if they had dealt with these two in the past. @Mike I think Tsj said Shandra was possibly abducted at 9:30, not stabbed at 9:30. I just reviewed the timeline for Preston's day and it reminded me of a question I had some time ago. What is Preston's normal route home from work after he gets off the bus? On a normal day, would Preston cut through the field (shortcut) to get to his apartment? If cutting through the field is Preston's normal route home and if he hadn't fallen asleep on the bus, according to his timeline that night, he would have been in the field around 9:42 pm. That is the same time you estimate Drew heard a woman scream. The one day you fall asleep on a bus and miss your stop, you are falsely accused of murder. Also, the one day you fall asleep on the bus and miss your stop, you avoid walking through a field where two kids are murdered. Either way, it is a big coincidence. The wounds that they received would have a time of death of no earlier than 10:45 and I would say that's even pushing it. They would be closer to 11:15 and 11:30. so the killer(s) meet them at 9:30, did something with them for an hour or an hour and a half and then killed them in the same field that they met them in? Sorry, I don't see that as very likely. I think the argument against that is that Shandra was already dead by the time the police found them and could have been killed at any time. I think Shaundra was clearly dead when the police found them. The question is why at that point in time did the police want Shaundra to be alive to identify her assailant? It's called Framing the Guilty. They think the have the right guy and they don't want him to get away with it. So they manufacture evidence to make sure the bad guy is put away. Think OJ Simpson (guilty) and the glove (planted). The problem is, sometimes in an effort to frame the guilty, they frame the innocent.